To become a one-stop solution provider for Indoor Air Quality products and technologies with a focus on energy conservation. To be recognized for introducing new technologies for Indoor Air Quality and Energy Conservation. Also to create the necessary market awareness that helps all our customers in making informed decisions about improving air quality in their indoor surroundings with minimum energy impact. Innovation is what takes inventions further and turn them into great products. For us, Innovation is an exciting journey of exploration that has no final destination and we love it this way. Simplicity, for us is ‘ultimate sophistication’. 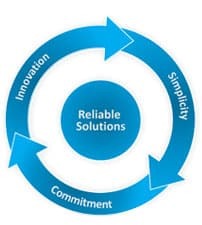 We believe that with sustained innovation, even a product based on high-end and complex technologies can and should offer solutions that are simple and uncomplicated to use by the customer.